MANCHESTER, N.H. — Gropacus 2020 is increasingly looking like a long-shot, Save Jerseyans. A brand new poll out from St. Anselm College Survey Center finds Cory Booker languishing in 7th place at 4% in the critical first primary state of New Hampshire, a result which suggests the New Jersey junior senator has yet to gain real traction with Democrat primary voters there. 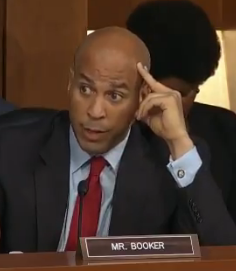 Booker trails Joe Biden (23%), Bernie Sanders (16%), South Bend Mayor Pete Buttigieg (11%), Elizabeth Warren (9%), Kamala Harris (7%), and Beto O’Rourke (6%). Next Next post: Murphy is blaming Sandy on climate change. That’s a stretch (at best).